Going to Scotland without sampling Scotch whisky (note: in most countries it's spelled "whiskey" but in Scotland it's "whisky" without the "e"!) 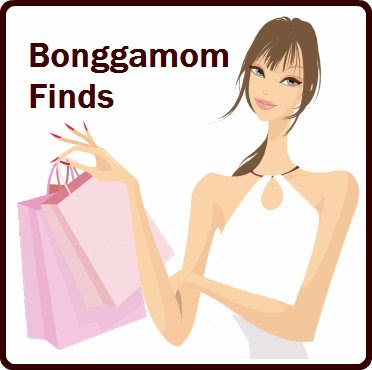 is like going to Napa without sampling wine. When we decided to go on a road trip to Scotland this summer, we had visions of hopping from distillery to distillery, savoring different kinds of Scotch. Alas, it was not to be; our whisky tour is going to have to wait till a future visit, but we did get to learn about whisky production and taste a few great whiskies on this trip. While researching for our trip, I discovered that most of the Scottish distilleries were located too far north for us to visit in the limited amount of time we had. 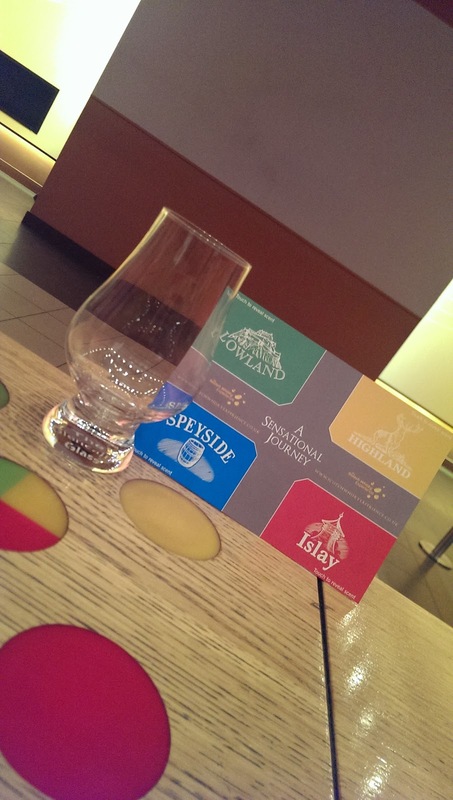 Our travels were limited to the Scottish Lowlands, and there are only 4 remaining working lowland distilleries. 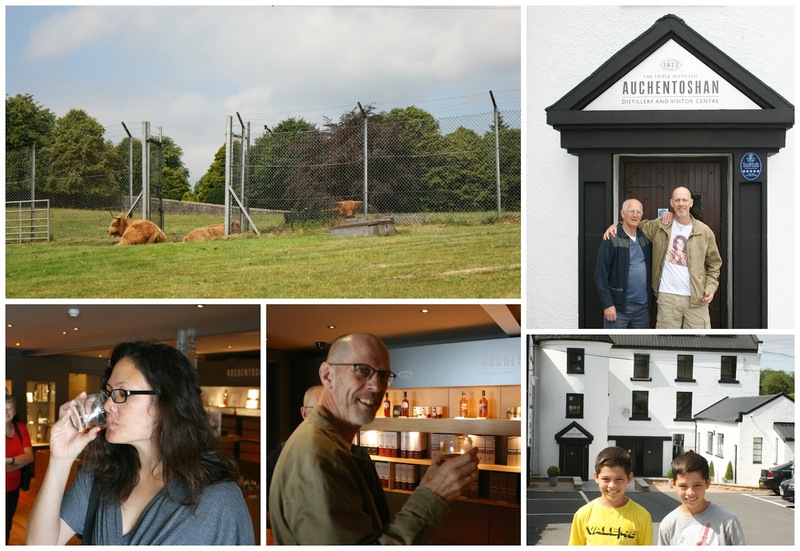 We chose to visit the one closest to our travel route: Auchentoshan Distillery, located in the town of Clydebank, very close to Glasgow. Auchentoshan (OCKenTOEshan) produces single malt whisky (made only from malted barley, as opposed to blended whiskey, which uses barley as well as other grains such as wheat and rye). They are the only distillery in Scotland to have a third still, triple-distilling their whisky to produce a distinctly lighter taste. Unfortunately, distilling operations were not scheduled to begin for a couple of weeks more, so rather than pay to take a tour of an empty distillery, we decided to spend our money on whisky tastings instead. We sampled their Three Wood single malt whisky, which aside from being distilled 3 times (like all of Auchentoshan's whiskies) is matured in 3 different casks, each made of different types of wood. The 3 different types of wood give the whisky lots of complex flavors. I've always found Scotch way too strong, so I was really surprised to discover how smoothly this whiskey went down. I think I must be a single malt gal! Naturally, we had to buy some whisky to take home with us, along with some shot glasses and whisky cake! After making our purchases, we took some time strolling around the distillery grounds and admiring the "wee coos" (they're Scottish cows and they're not that wee) grazing on the grass. 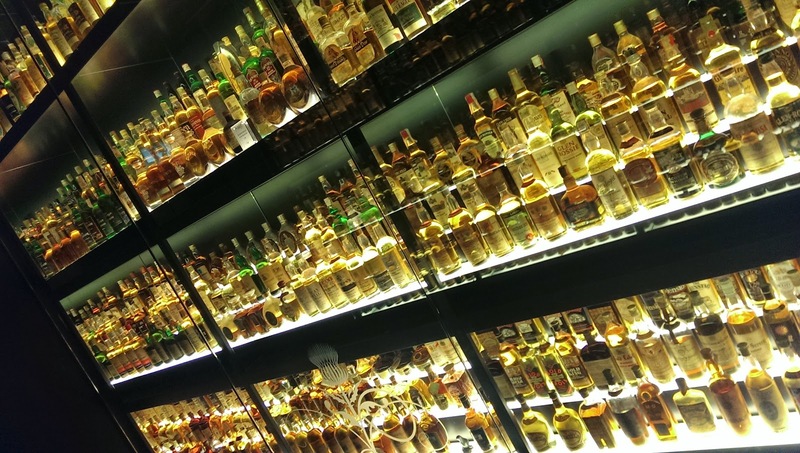 Once we got to Edinburgh, we had another opportunity to learn about Scotch Whisky. 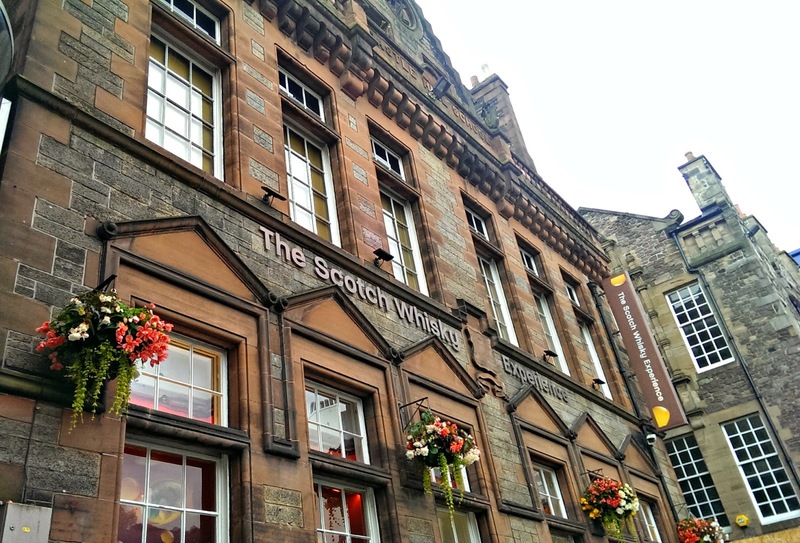 The Scotch Whisky Experience is located on Edinburgh's Royal Mile, near the entrance to Endiburgh Castle. It's kind of a touristy attraction, but hey, we were tourists, and we knew wouldn't be visiting any more distilleries, so we decided to check it out. 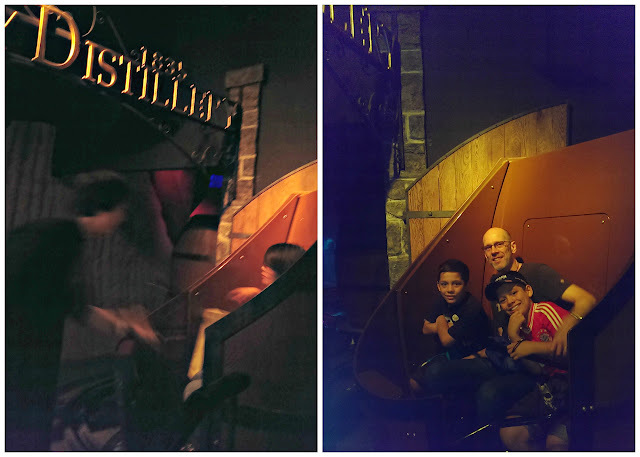 The first part of our tour was a barrel ride, not unlike the dark ride attractions at Disneyland. Visitors board a moving whiskey barrel that takes them through the process of whiskey making, from malting (turning barley into malt) to mashing (steeping the malt in hot water to release the sugars) to fermentation (mixing with yeast and allowing the yeast to "eat" the sugars and produce alcohol) to distillation (evaporating and condensing the liquid to concentrate the alcohol) to maturation (storing in caskets). Once the barrel ride ended, we were taken to a tasting room where a guide showed us a video introducing us to the different whisky producing regions of Scotland: Lowlands, Highlands, Speyside, and Islay (pronounced IS-la). We learned the unique aromas and tasting notes of each region -- Lowland whiskies are light and citrusy, with notes of grass and lemon and orange, Speyside Whiskies are very smoky and peppery, etc... We were given scratch-and-sniff tasting cards so we could smell the most distinctive aromas of each region and make a decision about which kind of whisky we wanted to sample. Alfie chose a Speyside whiskey, and it smelled and tasted just as peppery and smoky as it smelled on the scratch-and-sniff card! The kids got Irn Bru, a nonalcoholic carbonated drink that's very popular in Scotland (it was delicious!). 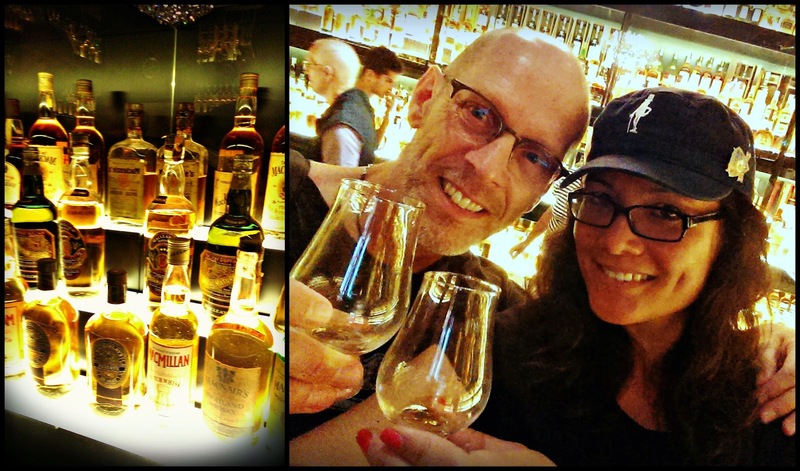 Holding our whisky glasses, we were led into another room containing the largest Scotch Whisky collection in the world. We sipped our whiskies and admired the floor-to-ceiling glass cabinets displaying hundreds upon hundreds of bottles of all shapes and sizes. 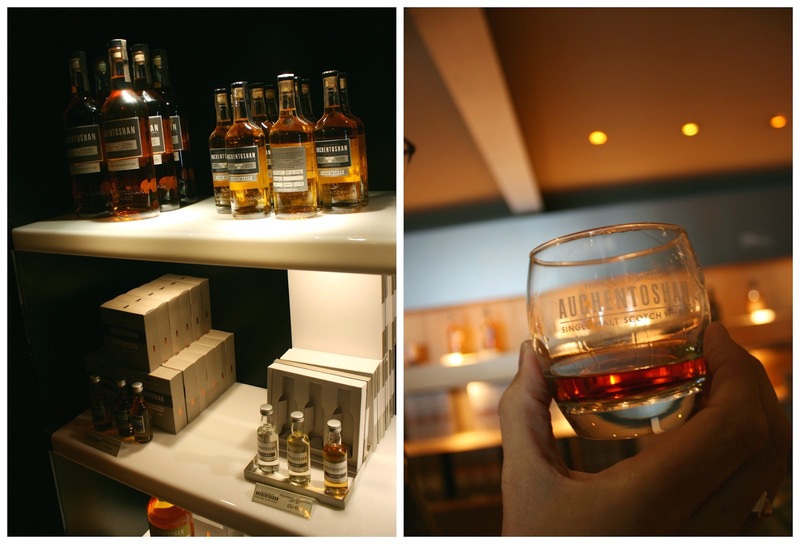 The tour ended at the tasting bar, where visitors who purchased premium tour tickets could sample more whiskies (We purchased the basic tour, which included only 1 tasting, so we made sure we sampled different whiskies and sipped from each other's whisky glasses. We're cheap that way). To get to the exit, we had to make our way through the gift shop, which included the usual souvenirs (shirts, posters, books, etc..) as well as whisky products (shot glasses, whisky chocolates, whisky cake, and lots of whisky!). The whole tour lasted about an hour, but we had to wait in line about 30 minutes to start the tour (the slow-moving barrel ride was the bottleneck). I would budget close to 2 hours, especially if you plan to spend some time in the gift shop. We left Scotland with a few bottles of whisky, a lot of fun memories of our whisky tours, and, in Alfie's case, a newly-found taste for whisky. He has bought a few more samples at our local wine shop and has begun to pour himself a wee dram now and then. We've already decided that the next time we visit Scotland, we'll be going farther up north to the Speyside or Highlands region, so we can finally go distillery hopping. Till then, Sláinte!